Restricting Anaerobic Glycolysis Reliance (Warburg effect): Novel Natural Products Based Therapeutic Strategy for Cancer Treatment. Compared to normal cells, cancer cells depend on the generation of excessive amounts of metabolic energy to induce cellular proliferation and metastatic growth. In the presence of oxygen, normal cells predominantly utilize mitochondrial oxidative phosphorylation; whereas cancer cells rely on the anaerobic glycolysis pathway-converting glucose to lactate-to fulfil their respective energetic requirements. This preference by cancer cells towards the anaerobic glycolysis process in normal oxygen level environments is known as the “Warburg effect”. The phosphatidylinositol-3 kinase (PI3K) and AMP-activated kinase (AMPK) pathways play important roles in aerobic glycolytic signaling and regulation. Specifically, the PI3k pathway regulates glycolysis-through AKT1 protein kinase (AKT1) and mTOR signaling-thereby activating the hypoxia inducible transcription factor (HIF-1) response. Furthermore, AMPK controls cell proliferation under metabolic stress conditions, where active AMKP inhibits mammalian target of rapamycin (mTOR) activity. The elevated anaerobic glycolysis levels among many tumors are hypoxic and the glycolysis inhibitors have potential applications in curbing cancer proliferation and metastasis. Several natural products target various proteins participating in cellular glycolysis, by interfering with the glycolytic signaling pathways. Numerous natural products with diverse structural characteristics have been identified as potential targets to restrict aerobic glycolysis in cancer cells. Recently, 2-deoxy-D-glucose (1), 3-bromopyruvate (2), 3-bromo-2-oxopropionate-1-propyl ester (3), 5-thioglucose (4) and dichloroacetic acid (5) were investigated as potential glycolysis inhibitors. Furthermore, natural product compound classes-such as alkaloids flavonoids, polyphenols, quinones, and terpenoids-showed promising anticancer and anti-metastatic activities, through the restriction of aerobic glycolysis, and promotion of anaerobic glycolysis in cancer cells. Warburg effect, Glycolysis, Dichloroacetic acid, Flavonoids, Polyphenols. Normal healthy cells generate energy-carrying molecule, Adenosine Triphosphate (ATP), by oxidative breakdown of pyruvate within the mitochondria. Conversely, cancer cells avoid this oxidative metabolism, as it requires large amounts of oxygen which is in short supply. These cells generate energy by the non-oxidative breakdown of glucose (anaerobic glycolysis), a process known as the “Warburg Effect”. Cancer cells share several well-defined characteristics, such as: 1. Uncontrolled replication; 2. Indifference to death signals; 3. Shunning of apoptosis; 4. Self-sustenance in growth signaling; and 5. Instigate angiogenesis and metastasis. It has been observed that cancer cells with mitochondrial dysfunction will generate ATP through the non-oxidative pathway. It has been suggested that the Warburg effect maybe as a result of (A) mitochondrial dysfunction in cancer cells, (B) an evolutionary adaptation to low-oxygen environments of tumors, (C) cancer genes shutting down the mitochondrial function, involved in cellular apoptosis through intrinsic pathway mechanisms. Since glycolysis supplies most of the building blocks required for cellular proliferation, these cells depend on activation of glycolysis even in oxygen rich environment . The high rate of glycolysis in aerolytic activity results in the overexpression of mitochondrial-bound hexokinases, responsible for the high glycolytic activity . Proliferative cancer cells require the surplus production of lipids, nucleotides and amino acids to construct new biomass. Cancer cells predominantly produce ATP through lactic acid fermentation in the cytosol; rather than by a comparably low rate of energy efficient glycolysis, followed by the pyruvate oxidation pathway and the citric acid cycle, as observed in mitochondria of normal cells. Healthy cells generate energy from aerobic glycolysis associated with oxidative phosphorylation, which is energy efficient process that generates approximately 38 molecules of ATP from each molecule of glucose consumed . Furthermore, with the stimulation of glucose uptake, cancer cells down-regulate mitochondrial Oxidative Phosphorylation (OXPHOS) to generate ATP for energy; and up-regulate glucose processing through aerobic glycolysis and the Pentose Phosphate Pathway (PPP) . Cancer cells of a specific tissue possess glycolytic rates greater than 200 times, higher than their neighbouring normal cells. Otto Heinrich Warburg postulated that the cellular level switching toward high energy production through glycolysis is the fundamental cause of cancer . Compared to normal cells, cancer cells are highly proliferative and therefore depend on a faster mode of energy production. Glucose that enters into a cell is subject to a series of enzymatic reactions to generate pyruvate, which is subsequently transported to the mitochondria to be metabolized into carbon dioxide, water, and ATP. Under anaerobic conditions, pyruvate is fermented into lactate via a catalytic Lactate Dehydrogenase (LDH) reaction. Cancer cells predominantly convert pyruvate to lactate, even under aerobic condition. Hence, LDH-A overexpression is commonly observed in cancer cells [6,7]. Furthermore, LDH-A inhibition has been shown to reduce cellular transformation, delay tumor initiation, and inhibit growth in breast cancer xenografts [8,9] The depletion of LDH-A activity results in cellular apoptosis induced by mitochondria by generating reaction oxygen species . LDH-B, another member of LDAs is overexpressed in non-malignant tissues relative to tumors. Depletion of LDH-B expression is an early and typical event in human breast cancer arising as a result of promoter methylation, which is probably because of an augmented glycolysis in cancer cells under hypoxia . Since LDH has a pivotal role in aerobic glycolysis-a central point for cancer cell metabolism- research on lactate mediated glycolysis inhibition is considered a promising target to combat cancer. Several drugs developed to act on this target include 2-deoxy-D-glucose (1), 3-bromopyruvate (2), 3-bromo-2-oxopropionate-1-propyl ester (3), 5-thioglucose (4) and dichloroacetic acid (5) . Hypoxia Inducible Factor-1 (HIF-1) is a vital transcription factor that plays a major role in the metabolic programing of tumor growth. The adenosine 5’-monophosphae-(AMP-) activate protein kinase (AMPK), phsphoinositide-3-kinase (PI3K)-/Akt, and Extracellular Regulated protein Kinase (ERK) play important function in signaling pathways, to stimulate glucose metabolic processes in cancer cells. In contrast, the majority of tumor suppressors, P53 and von Hippel-Lindau (VHL), antagonize these changes to keep cellular metabolism under control. Loss of VHL protein function can result in autosomal-dominant cancer syndrome (VHL disease). This disease manifests as retinal angiomas, hemangioblastomas of the central nervous system, renal clear-cell carcinomas, and pheochromocytomas. Impaired VHL protein function results in the accumulation of HIF, over expression of several HIF-induced gene products, and the development of highly vascular neoplasia. Glucose transporters-glucose transporter 1 (GLUT 1) and 4 (GLUT 4)- are up-regulated by HIF-1, which also induces the expression of the glycolytic enzymes, Hexokinase (HK), Pyruvate Kinase (PK), and Lactate Dehydrogenase (LDH-A). HIF activation enhances angiogenesis and increases glucose uptake. Furthermore, HIF is associated with the mTOR pathway, an essential control of cellular growth. Hence it has been suggested that HIF activation may incapacitate the mTOR pathway [13,14]. Tumor M2-PK, a pyruvate kinase enzyme relative, gave rise to Warburg effect. M2-PK kinases are usually limited to cancer cells and seldom observed in normal cells. Rapidly proliferating tumor cells result in tumor M2-PK enabling cancer cells to consume glucose at elevated levels. The inhibition of tumor M2-PK production generates an alternative form of pyruvate kinase in tumor cells, which prevents tumor cell growth. Thus, M2 expression is an essential component of aerobic glycolysis (Figure 1) [15,16]. Figure 1. 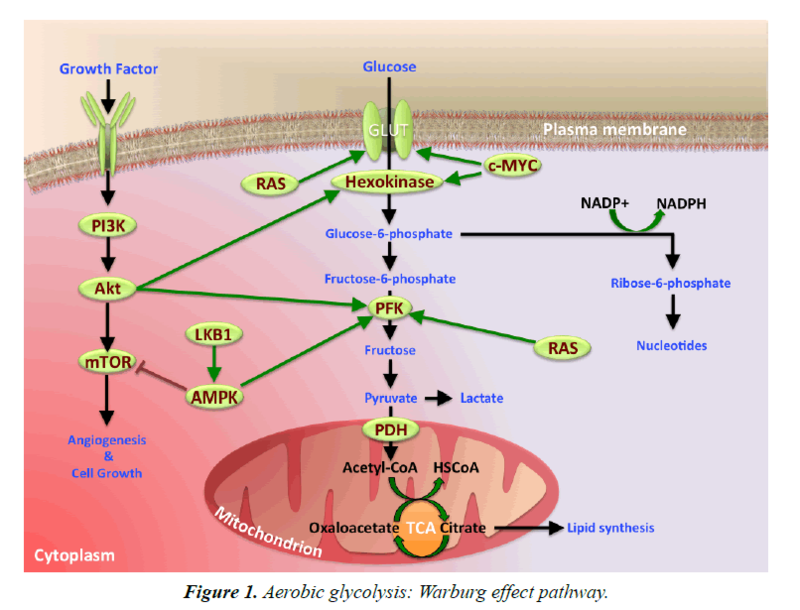 Aerobic glycolysis: Warburg effect pathway. Natural products can regulate the HIF-1 induced Warburg effect. Glucose transporters and dehydrogenates are closely related to glycolysis. Several natural products affect the expression of glucose transporters, GLUT1 and GLUT4 circuitously, reasonably controlling upstream modulatory mechanisms. Several plants derived bioactive and structurally diverse anticancer compounds-including flavonoids, quinones, polyphenols and alkaloids-were also reported to control glucose transporter activity in different cancer cell models. 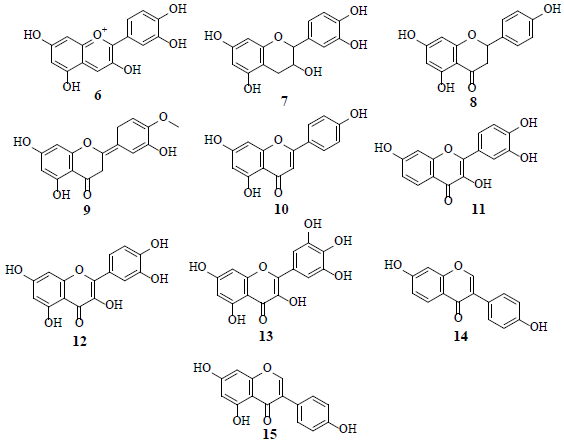 Flavonoids, such as cyanidin (6), catechin (7), naringenin (8), hesperetin (9) apigenin (10), fisetin (11), quercetin (12) myricetin (13), diadzein (14), and genistein (15), are known glucose uptake inhibitors in human U937 cells . Studies revealed that Genistein (15) attached to external surface of GLUT 1, whereas quercetin (12) intermingled with internal surface of GLUT 1. Combined, these observations suggest that 12 and 15 exhibit very different modes of action by binding to different GLUT 1 domains . HIF-1 is a transcription factor for numerous target genes, essential for immunological responses and is a vital physiological regulator of homeostasis, vascularization and anaerobic metabolism. Hence, the inhibition and stimulation of HIF-1 transcriptional activity by small molecules is an attractive research target in the cancer treatment . The HIF-1 pathway results in tumor proliferation, invasion, migration and adhesion which are important grounds for tumor malignancy. The inhibition of the HIF-1α pathway represents a promising approach in cancer therapy, as HIF-1α is over expressed in various human cancers and their metastasis. 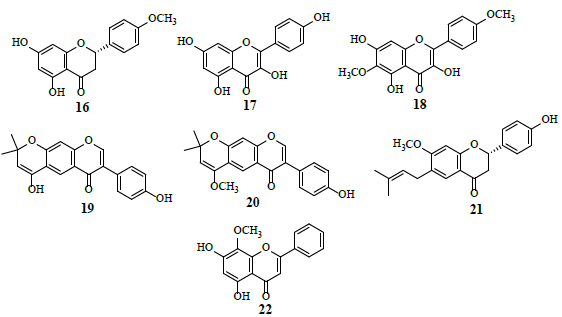 Several flavonoids, namely isosakuranetin (16), kaempferol (17), beturetol (18), alpinumisoflavone (19) and 4-O-methylalpinumisoflavone (20), were discovered to inhibit HIF-1α by restricting hypoxia-induced HIF-1 activation [20-22]. Bavachinin (21) hinders the increase in HIF-1α activity in human KB carcinoma and HOS osteosarcoma cells in hypoxia . Wogonin (22), a novel Multidrug Resistance (MDR) reversal agent, suppresses HIF-1α expression through the inhibition of PI3K/Akt signaling pathway resulting in glycolysis prevention [24,25]. Piceatannol (23) was examined for HIF-1α inhibitor potential, where it restricted hypoxia-induced HIF-1 activation . Drupanin (24) and baccharin (25) inhibit the expression of HIF-1 and its target genes as inhibitors of HIF-1-dependent luciferase activity . Curcumin (26) reverses the aerobic glycolysis, induced by an inflammatory microenvironment, independent of additional genetic mutations and signals from adjacent cells . Molecular docking studies suggest that curcumin interact with α-ketoglutarate-dependent deoxygenase (FTO) protein at glycine 86, lysine 107 and glutathione 325, followed by the formation of three hydrogen bonds with high binding affinity . Manassantin A (27), manassantin B (28) and 4-O-demethylmanassantin B (29) are potential HIF-1α inhibitors . A group of napthoquinones, alkannin (30), shikonin (31) and their derivatives exhibit potent inhibitory activity of PKM2 . 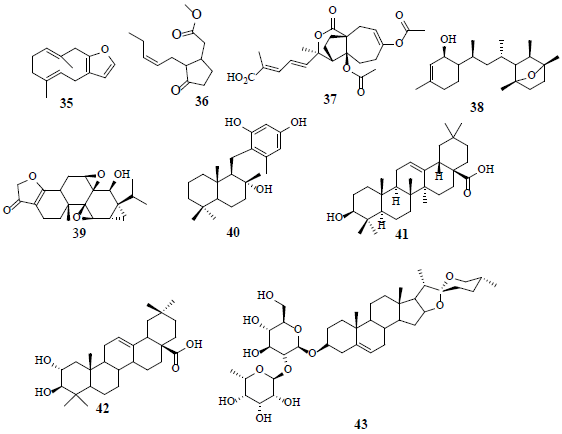 Furthermore, shikonin (31) display synergism with taxol (32), involved in the inhibition of ERK, Akt and p70S6 kinases . An anthraquinone, rhein (33), is a potential HIF-1α and angiogenesis inhibitor in hormone dependent and independent cancer cells . 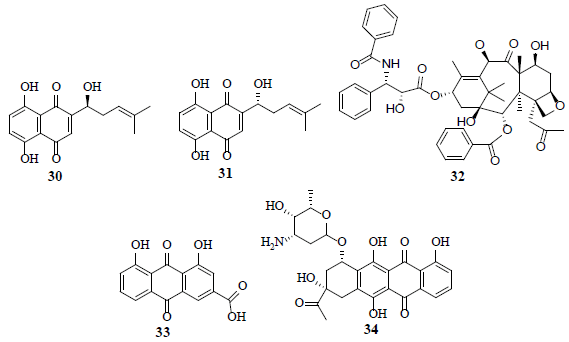 A anthracycline, carminomycin I (34) inhibits VHL defective (VHL-/-) clear cell renal cell carcinoma (CCRCC) cell proliferation and the P-gp mediated localization of carminomycin I (34) in CCRCC cells. P53, a tumor suppressor initiates the cell cycle arrest along with cell death after DNA damage and contributes to the genomic stability maintenance. In addition, P53 negatively delimits glycolysis through activation of P53-induced glycolysis regulator (TIGAR) . Furanodiene (35), a terpenoid with furan ring attachment, is observed to increase LDH release in cancer cells by prompting cell injury. Therefore, the change of LDH-A levels prevents cancer proliferation by hindering the metabolism or inducting cell damage. The glycolytic enzyme glyceraldehyde-3-phosphate dehydrogenase (GAPDH) exhibits numerous non-canonical functions, implicated in cell growth and survival by hypoxic-independence pathway . Methyl jasmonate (36) intercalates to HK and disrupts its association with the voltage dependent anion channel (BDAC), leading to overall energetic impairment and stimulates the release of mitochondrial cytochrome C, triggering apoptosis in cancer cells . The observed anticancer activity of pseudolaric acid B (37) is attributed to the restriction of hepoxia-induced HIF-1α activation by promoting proteasome-mediated degradation. Furthermore, pseudolaric acid B (37) mitigates angiogenesis . 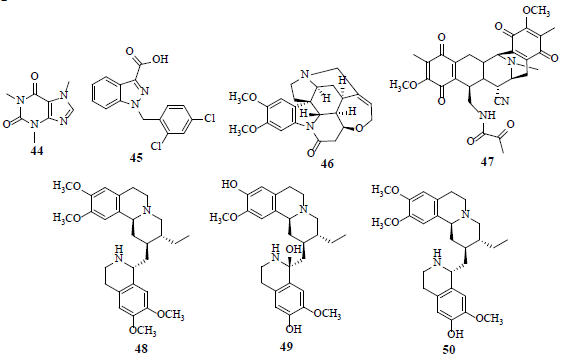 Laurenditerpenol (38), isolated from marine red algae Laurencia intricate, is a selective and effective inhibitor of HIF-1 and hypoxia-induced VEGF in T47D cells. Laurenditerpenol (38) inhibits HIF-1 by hindering the induction of the oxygen-regulated HIF-α protein and suppressing the oxygen consumption of mitochondrial respiration . Triptolide (39), isolated from Chinese herbal extracts, enhances drug sensitivity in resistant myeloid leukaemia cell lines through down regulation of HIF-1α and Nrf2 . The fungal product, neoalbaconol (40), reduces the glucose consumption and ATP generation by targeting PDK 1 and inhibits its downstream PI3-K/Akt-HK2 pathway, resulting in energy diminution . Moreover, oleanolic acid (41), a pentacyclic triterpenoid compound, inactivates mTOR signaling pathway by switching PKM2/PKM1 and supressing aerobic glycolysis in cancer cells. Therefore, it is suggested that PKM2 should be further explored as an important target in the aerobic glycolysis pathway to develop innovative anticancer agents. Oleanolic acid (41) activates AMPK-an important regulator of metabolism-in both prostate (PC-3) and breast (MCF-7) cancer cell lines [41,42]. 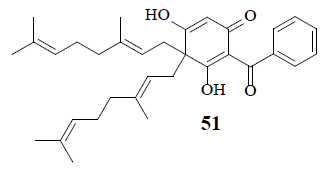 Maslinic acid (42) has a close structural resemblance to oleanolic (41) acid with an additional hydroxyl at C-3 position. Maslinic acid (42) ameliorates neuron injury and apoptosis in hypoxic-cortical neurons. Furthermore, maslinic acid (42) inhibits oxygen-glucose deprivation-induced nitric oxide (NO) production and inducible nitric oxide synthase (iNOS) and provides neuro-protection . Prosapogenin A (43), a steroid sapogenin, curbs cell growth and stimulates cell apoptosis of MCF7 through the reduction of signal transducer followed by the activation of transcription 3 (STAT 3) and glycometabolism-related genes, GLUT1, HK, and PFKL . Caffeine (44) reduces p53α expression and induces p53β expression. Furthermore, caffeine (44) prompts the alternative splicing of other serine/arginine-rich splicing factor 3 (SRSF3) target genes, GLUT1, HIF-1α and HIF2α . Lonidamine (45), a HK inhibitor, a relatively new drug that impedes mitochondrial function, is observed to inhibit cellular oxygen consumption and energy metabolism in both normal and neoplastic cells. Another HK inhibitor, namely 2-deoxyglucose, is in the clinical trials (phase 1 and 2) for the treatment of advanced cancer and hormone refractory prostate cancer . Brucine (46) stifles HIF-1-dependent luciferase activity in HepG2 cells and shows inhibitory effect in the lung metastasis of H22 ascitic hepatoma cells in tumor bearing mice . Saframycin A (47) crafts a nuclear ternary complex with GAPDH and DNA, unveiling anti-proliferative properties in adherent as well as non-adherent cancer cells . Emetine (48), klugine (49) and isocephaeline (50) inhibit HIF-1 activation by hypoxia in T47D breast tumor cells. Furthermore, compounds 48-50 inhibit hypoxia- and iron chelator-induced HIF-1 stimulation, by hindering HIF-1α protein accumulation . Moronne (51), a bis-geranyl phloroglucinol derivative, exhibits anti-proliferative cytotoxic activity in the presence of retinone-induced metabolic stress in tumor cells. Captivatingly, even though it does not inhibit glycolysis yet functions as a protonophore that depletes the mitochondrial proton gradient. Due to the increased ATP consumption by the ATP synthase, tumor cells may be hypersensitive to protonophores in the presence of rotenone resulting in ineptness of Warburg effect in cancer cells . Tumor cells amend their glucose metabolism and largely confide on glycolysis for their energy need even in the aerobic environment. Warburg effect involves the complex control of the expression of multiple genes and metabolic pathways. In comparison with synthetic compounds, natural products wield multiple advantages as a result of their large-scale structures and multifarious targets. Selective natural products curb the expression as well as the activity of glycolytic enzymes and genes that can inhibit the glycolysis of tumor cells. Targeting HIF-1 and hypoxic related factors impair cancer cell survival through multiple factors, such as: 1) By attenuating tumor glucose metabolic process, 2) By inhibiting VEGF induced pro-survival and angiogenesis pathways, and 3) By up regulation of HIF-1 and glycolysis pathways-specifically PI2K and AMPK-as source of tumor metabolic inhibitors or energy restriction mimetic agents. The interplay between cancer cell metabolism and altered gene expression suggests that many of the anticancer activities ascribed to natural products deregulate cancer metabolism. Lopez-Lazaro M. The Warburg effect: why and how do cancer cells activate glycolysis in the presence of oxygen? Anti-Cancer Agents in Med Chem. 2008;8:305-12. Bustamante E, Pedersen PL. High aerobic glycolysis of rat hepatoma cells in culture: role of mitochondrial hexokinases. Proc Nat Acad Sci USA. 1977;74. Dhup S, Dahdhich RK, Porporato PE, et al. Multiple biological activities of lactic acid in cancer: influences on tumour growth, angiogenesis and metastasis. Curr Pharm Des. 2012;18:1319-30. Kelly B, O’Neil LA. Metabolic reprograming in macrophases and dendritic cells in innate immunity. Cell Res. 2015; 25:771-84. Warburg O. On the origin of cancer cells. Science. 1956;123:309-14. Goldman RD, Kaplan NO, Hall TC. Lactic dehydrogenase in human neoplastic tissue. Cancer Res. 1964;24:389-99. Koukourakis MI, Kontomanosis E, Giatromanolaki A, et al. Serum and tissue LDH levels in patients with breast/gynaecological cancer and benign diseases. Gynecol Obstet Invest. 2009;67:162-8. Le A, Cooper CR, Gouw AM, et al. Inhibition of lactate dehydrogenase A induces oxidative stress and inhibits tumor progression. Proc Natl Acad Sci USA. 2010;107:2037-2042. Sheng SL, Liu JJ, Dai TH, et al. Knockdown of lactate dehydrogenase A supresses tumor growth and metastasis of human hepatocellular carcinoma. FEBS J. 2012;279:3898-910. Wang ZY, Loo TY, Shen JG, et al. LDH-A silencing supresses breast cancer tumorigenicity through induction of oxidative stress mediated mitochondrial pathway apoptosos. Breast Cancer Res Treat. 131:791-800. Brown NJ, Higham SE, Perunovic B, et al. Lactate dehydrogenase-B is silenced by promoter methylation in a high frequency of human breast cancers. PloS One. 2013;8:e57697. Czyzyk-Krzeska MF, Meller J. Von Hippel-Lindau tumor suppressor: not only HIF’s executioner. Trends Mol Med. 2004;10:146-9. Brugarolas J, Lei K, Hurley RL, et al. Regulation of mTOR function in response to hypoxia by REDD1 and the TSC1/TSC2 tumor suppressor complex. Genes Dev. 2004;18:2893-904. Christofk HR, Vander Heiden MG, Ramanathan A, et al. The M2 splice isoform of pyruvate kinase is important for cancer metabolism and tumor growth. Nature. 2008;452:230-3. Pederson PL. Warburg, me and hexakinases 3, ie. Elevated glycolysis in the presence of oxygen. J. Bioeng. Biomembranes. 2007;39:211-322. Park JB. Flavonoids are potential inhibitors of glucose uptake in U937 cells. Biochem Biophys Res Comm. 1999; 260:568-74. Perez A, Ojeda P, Ojeda L, et al. Hexose transporter GLUT1 harbors several distinct regulatory binding sites for flavones and tyrphostins. Biochem. 2011;50:8834-45. Ziello JE, Jovin IS, Huang Y. Hypoxia- inducible factor (HIF)-1 regulatory pathway and its potential for therapeutic intervention in malignancy and ischemia. Yale J Biol Med. 2007;80:51-60. Hattori H, Okuda K, Murase T, et al. Isolation, identification and biological evaluation of HIF-1-modulating compounds from Brazilin green propolis. Bioorg Med Chem. 2011;19:5392-5001. Mylonis I, Lakka A, Tsakalof A, et al. The dietary flavonoid kaempferol effectively inhibits HIF-1 activity and hepatoma cancer cell viability under hepoxic conditions. Bio-chem Biophys Res Comm. 2010;398:74-8. Liu Y, Venna CK, Morgan JB, et al. Methylalpinumisoflavone inhibits hepoxia-inducable factor-1 (HIF-1) activation by simultaneously targeting multiple pathways. J Biol Chem. 2009;284:5859-68. Nepal M, Choi HJ, Choi BY, et al. Anti-angiogenic and anti-tumor activity of bavachinin by targeting hypoxia-inducable factor-1α. Eur J Pharmacol. 2012;691:28-37. Wang H, Zhao L, Zhu LT, et al. Wogonin reverses hypoxia resistance of human colon cancer HCT116 cells via downregulation of HIF-1α and glycolosis, by inhibiting PI3K/Akt signalling pathway. Mol Carcinogenesis. 2014; 53:E107-18. Zhao K, Song X, Huang Y, et al. Wogonin inhibits LPS-induced tumor angiogenesis via supressing PI3K/Akt/NF-ĸB signalling. Eur J Pharm. 2014;737:57-69. Yum S, Doh HJ, Hong S, et al. Piceatannol, a hydroxylstilbene natural product, stabilizes HIF-1 protein by inhibiting HIF prolyl hydroxylase. Eur J Pharm. 2013;699:124-31. Hattori H, Okuda K, Murase T, et al. Isolation, identification and biological evaluation of HIF-1-modulating compounds from Brazilin green propolis. Bioorg Med Chem. 2011;19:5392-401. Vaughen RA, Garcia-Sith R, Dorsey J, et al. Tumor nacrosis factor alpha induces Warburg-like metabolism and is reversed by anti-inflammatory curcumin in breast epithial cells. Int J Cancer. 2013;133:2504-10. Archana P, Sathiskumar N, Bharthi N. in Silico docking analysis of curcumin-an inhibitor for obesity. Int IJPBS. 2010;1:224-35. Hodges TW, Hossain CF, Kim YP, et al. Molecular targeted antitumor agents: The Saururus cernuus dineolignans, manassantin B and 4-0-demethyl-manassantin B are potent inhibitors of hepoxia-activated HIF-1. J Nat Prod. 2004; 67:767-71. Chen J, Xie J, Jiang Z, et al. Shikonin and its analogues inhibit cancer cell glycolysis by targeting tumor pyruvate kinase-M2. Oncogene. 2011;30:4297-306. Li W, Liu J, Jackson K, et al. Sensitizing with therapeutic efficacy of taxol with shikonin in human breast cancer cells. PLoS One. 2014;9:e94079. Fernand VE, Losso JN, Truax RE, et al. Rhein inhibits angiogenesis and the viability of hormone-dependent and independent cancer cells under normoxic or hypoxic conditions in vitro. Chemico-Biological Intercation. 2011;192:220-32. Woldemichael GM, Turbyville TJ, Linehan WM, et al. Carminomycin 1 is an apoptosis inducer that targets the golgi complex in ckear cell renal carcinoma cells. Cancer Year Res. 71:134-142. Zhong Z, Dang Y, Yuan X, et al. Furanodiene, a natural product inhibits breast cancer growth both in vitro and in vivo. Cell Physiol Biochem. 2012;30:778-90. Cohen S, Flescher E. Methyl jasmonate: a plant stressed harmne as an anti-cancer drug. Phytochem. 2009;70:1600-9. Li MH, Miao ZH, Tan WF, et al. Pseudolaric acid B inhibits angiogenesis and reduces hypoxia-inducible factor 1a by promoting proteasome-mediated degradation. Clin Cancer Res. 2004;10:8266-74. Mohammed KA, Hossain CF, Zhang L, et al. 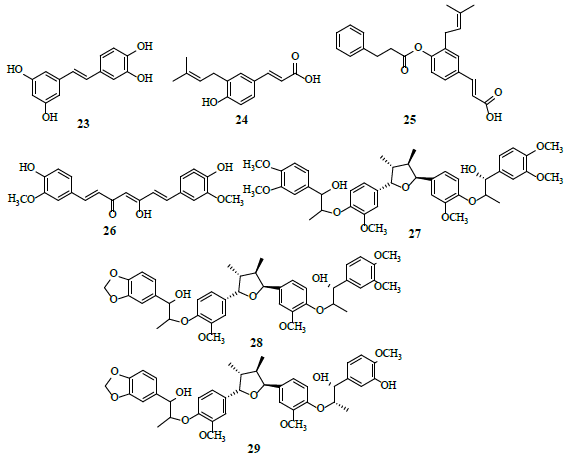 Laurenditerpenol, a new diterpene from the tropical marine alga Laurencia intricate that potently inhibits HIF-1 mediated hypoxic signaling in breast tumor cells. J Nat Prod. 2004;67:2002-7. Chen F, Liu Y, Wang S, et al. Triptolide, A Chinese herbal extract, enhances drug sensitivity of resistant myeloid leukaemia cell lines through down regulation of HIF-1a and Nrf2. Phramcogenomics. 2013;14:1305-17. Deng Q, Yu X, Xiao L, et al. Neoalbaconol induces energy depletion and multiple cell death in cancer cells by targeting PDK1-PI3-K/Akt signaling pathway. Cell Death Dis. 2013;4:e804. Liu J, Wu N, Ma L, et al. Oleanolic acid supresses aerobic glycolosys in cancer cells by switching pyruvate kinase type M isoforms. PLoS One. 2014;9:e91606. Liu Y, Cao Y, Zhang W, et al. A small-molecule inhibitor of glucose transporter 1 downregulates glycolysis induces cell cycle arrest and inhibits cancer cell growth in vitro and in vivo. Mol Cancer Ther. 2012;11:1672-82. Qian Y, Guan T, Tang X, et al. Maslinic acid, a natural triterpenoid compound from Olea europaea, protects cortical neurons against oxygen-glucose deprivation-induced injury. Eur J Pharmcol. 2011;670:148-53. Wang TX, Shi XY, Cong Y, et al. Prosapogenin A inhibits cell growth of MCF7 via downregulating STAT3 and glycometabolism-related gene. Yao Xue Xue Bao. 2013;48:1510-14. Lin WS, Lu GY, Huang SM, et al. Caffeine induces tumor cytotoxicity via the regulation of alternative splicing in subsets of cancer-associated genes. Int J Biochem Cell Biol. 2014;47:93-92. Pathania D, Millard M, Neamati N. Opportunities in discovery and delivery of anticancer drugs targeting mitochondria and cancer cell metabolism. Adv Drug Delivery. 2009; 61:1250-75. Shu G, Mi X, Cai J, et al. Brucine, an alkaloid from seeds of Strychnos nux-vomica Linn., represses hepatocellular carcinoma cell migration and metastasis: the role of hypoxia inducible factor 1 pathway. Toxicol Lett. 2013;222:91-101. Xing C, LaPorte JR, Barbay JK, et al. Identification of GAPDH as a protein target of the saframycin antiproliferative agents. Proc Nat Acad Sci USA. 2004;101:5862-6. Zhou YD, Kim YP, Mohammed KA, et al. Terpenoid tetrahydroisoquinonine alkaloids emetine, klugine and iso-cephaeline inhibit the activation of hepoxia-inducable factor-1 in breast tumor cells. J Nat Prod. 2005;68:947-50. Daatta S, Li J, Mahdi F, et al. Glycolysis inhibited screening identifies the bis-geranylacylphlorglucinol prrotonophore moronone from Moronobea coccinea. J Nat Prod. 2012;75:2216-22.